Slower GeForce 9600 GT ? | Its Madh !!! Home » GeForce » Slower GeForce 9600 GT ? According to roumers, Nvidia is planning to introduce low power version of Geforce 9600 GT. 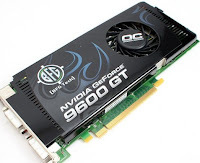 The Geforce 9600 GT "Green edition" is based on Nvidia G94-350-B1 graphics chip in 55 nm ( nanometer) technology. Comparing the standard Geforce 9600 GT, it is sure that it will give 2 % of less power consumption. The Clock frequency is reduced from 650 Mhz to 600 Mhz. The Memory clock of this GDDR3 card is 900 MHz. It consumes some 20 watts of electrical power during the idle time .